Two scholars from the University of Chicago have recently completed a new translation of the Tempest Stela, a 3,500 year-old Egyptian text from Thebes. This text describes days of weather consisting of the ‘sky being in storm without cessation’, a ‘tempest of rain’, and the dead floating down the Nile like boats of papyri. The conclusions from this new reading suggest this weather pattern is a result of the volcanic eruption at Thera, and actually gives a new date to the event, more in line with recent carbon dating than scholars have previously thought. Many of these islands that Strabo names were, in fact, actively erupting during this period of antiquity. 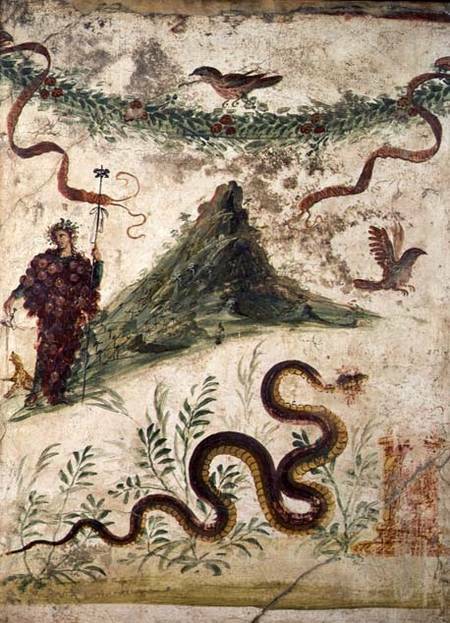 The Pompeians would not have had to look far for examples of volcanic activity. The Aeolian Islands of Stromboli, Lipari and Vulcano were all active – Stromboli, or Thera in antiquity, had been continuously active for 2500 years. Livy described the emergence of new island between Lipari and Vulcano in 183 BC. There is also a fair amount of physical evidence that has survived in the archaeological record that demonstrates that the inhabitants of the Bay of Naples were dealing with seismic activity regularly. Work carried out by the Herculaneum Conservation Project along the ancient coastline has revealed regular changes in the coastline and water levels as a result of bradyseism. Both the House of the Telephus Relief and the Suburban Baths had to block of access points to the structures in order to prevent flooding. Some have speculated that the changes in the water levels were also responsible for the abandonment (and eventual total submersion) of the Portus Iulius at Misenum. Built in 37 BC, it became impossible to use within twenty-five years, which shows how dramatically levels were changing in that period. This is still a massive problem in the area today.